One of the biggest WWE pay-per-view events of the year is coming up, this weekend. Survivor Series is this Sunday, and currently there is not a team for the Raw brand in their traditional Survivor Series match against the SmackDown brand. Last week, Alexa Bliss was announced as Team Captain, however, she will not be participating in the match. On the SmackDown side of the match, General Manager Paige announced their team to be Asuka, Naomi, Carmella, Sonya Deville, and Charlotte Flair. Flair’s involvement in the team could be questionable at this point, because of her absence during the announcement. Taking a look at this list of participants for the blue brand, they are all baby faces. It would make sense for Bliss to choose a team of heels to be her preferences. From this formula, there are five women who have a good chance to take their place on the team. Mickie James and Alicia Fox seemingly are a shoe-in to be picked by Bliss for this match. James has history with Bliss, and since February of this year, she has been the “right hand man” for the captain. Fox came into the fold when she assisted Bliss during her rivalry with Ronda Rousey, this summer. Neither James nor Fox had matches on Raw last week, so her choosing them over Sasha Banks or Bayley would create the heat that Bliss loves. The third participants of the team that Bliss may pick is Ruby Riott. 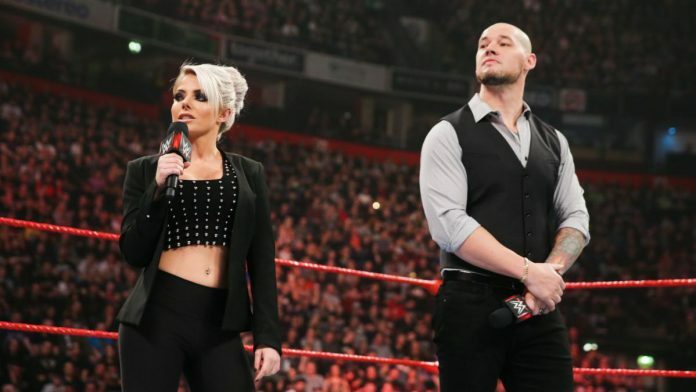 Riott and her squad have been dominating Raw since they were moved to the Red Team after Wrestlemania this year, during the Superstar Shake-Up. They have had various feuds with Bayley, Sasha Banks, Natalya, Ember Moon, and the Bella Twins. Last week Bliss put the Riott Squad in their rematch against Sasha Banks, Bayley, and Natalya from the Evolution pay-per-view. Natalya came to the ring that night with her late father’s (Jim “the Anvil” Neidhart) glasses, standing as a dedication to him. Riott was able to take advantage of this situation. At the culmination of the match, Natalya had the win in her sights, locking Sarah Logan in the sharpshooter. However, Riott was able to destroy Natalya emotionally by breaking her late father’s glasses right in front of her. This may be the perfect attitude that Bliss is looking for on her team. The last two participants, just as the first two mentioned, come as a pair. As of last week, Nia Jax has turned heel and aligned herself with Tamina. This turn of events stemmed from a match where Jax was facing her friend, Ember Moon. Tamina and Jax have had several interactions with each other since Tamina returned from injury. Their previous interactions have led to the WWE Universe thinking they were going to feud, but they have actually decided to join forces. After Jax picked up her win against Moon, Tamina made her way to the ring and locked a Boston Crab on Moon, allowing Jax to take advantage. The duo attacked Moon to end the segment. The newly formed strength of the Samoan cousins could be exactly what Bliss is looking for to take her team to victory this Sunday. Do you agree with these picks? Who would you like to see be on Team Raw for Survivor Series? Do you want Raw or Smackdown to take this win home for their brand?